Dr. Richard Weikart, author of From Darwin to Hitler: Evolutionary Ethics, Eugenics, and Racism in Germany. Contra Ruse’s claim, Nazis did not abandon Darwinism because of its racial egalitarian implications. In fact, the vast majority of Darwinists in the nineteenth and early twentieth centuries argued that Darwinism proved racial inequality. Darwin claimed in chapter two of The Descent of Man that there were great differences in moral disposition and intellect between the “highest races” and the “lowest savages.” Later in Descent he declared, “At some future period, not very distant as measured by centuries, the civilised races of man will almost certainly exterminate and replace throughout the world the savage races.” Racial inegalitarianism was built into Darwin’s analysis from the start. Full article.. This entry was posted on February 29, 2008 at 10:59 am	and is filed under Uncategorized. Tagged: Darwin, Hitler, Weikart. You can follow any responses to this entry through the RSS 2.0 feed. You can leave a response, or trackback from your own site. I find it rather ignorant to place blame on Darwin for eugenics, whilst ignoring Herbert Spencer’s role in formulating “Social Darwinism” in the first place. To regard Spencer as any kind of Darwinian, even of the ‘Social’ variety, is a gross distortion. He could never bring himself to abandon the idea that evolution equated to progress, that it involved the unfolding of a pre-existent pattern, and that there would be a final resting point – ‘equilibrium’ – in which an ultimate state of perfection was attained. Darwinian natural selection, with its open-ended process of change based on random variations that prospered or failed depending on their adaptation to environmental conditions, was thus far removed from Spencer’s vision of progressive development, and he struggled hard to find a place for it within his overall system. Thus, his use of the theory of natural selection could never be more than window dressing as it threatened the idea of universal evolutionary progress and thus the scientific foundation for morality that he hoped to establish. I have often requested of those who assert a “link” between the theory of evolution and Hitler’s actions an explanation of the logical connection between all extant biodiversity being related through common ancestry by way of heritable reproduction errors combined with environment-specific reproductive selection pressures and Hitler’s imposition of genocide. Thus far, not one individual has even attempted to show such a logical link. I believe it rational to conclude that the claim that the theory of evolution logically led to Hitler’s actions is itself not correct, and that those who have made the claim either have not attempted to rationally justify what they are saying, or are lying. I don’t doubt that you fail to see the point. It’s not “biodiversity being related through common ancestry” but the new idea that God is dead. Darwin provided a scientific justification for the movements I mention in my post. Read some Nazi literature and I just do not know how someone could not see the connection. History showed Sedgwick to be correct. I don’t doubt that you fail to see the point. It’s not “biodiversity being related through common ancestry” but the new idea that God is dead. “God is dead” is neither a direct part of the theory of evolution, nor is it a logical derivation of the theory of evolution. Anyone who claims that the theory of evolution provides logical justification for a claim that “God is dead” is not rational, is not honest or is lacking in understanding of what the theory actually states. Darwin provided a scientific justification for the movements I mention in my post. Then you should be able to logically explain such justification, rather than merely asserting it. Read some Nazi literature and I just do not know how someone could not see the connection. It is not honest to ask that I research your claims. As you have made the claims, you bear the responsibility of providing evidence — which would include relevant citations — for them. Ann Coulter — or whomever ghostewrote her chapters on evolution in her book — is apparently under the mistaken impression that the theory of evolution implies any consequences about “morality” at all. The theory of evolution is an explanation of biological events. It cannot address subjects of morality, as morality exists outside of the scope of biology. Whether or not “morality” exists or is a part of nature is not addressed and cannot be derived from the theory of evolution. Ann Coulter’s chapters on evolution demonstrate little more than a fundamental lack of understanding of the theory. In the above passage, she is attempting to appeal to consequence, by appealing to a previous individual’s own appeal to consequence. Even if the theory of evolution had unfortunate implications for concepts of “morality” — and thus far no one has actually demonstrated that it does have any such implications — those implications would not demonstrate that the theory of evolution is false. In appealing to Ann Coulter’s arguments on the subject, you are appealing to the same logical fallacy that she has employed. Your argument is, as such, inherently faulty. Right – as though Coulter has two brain cells to rub together, or isn’t a hateful scourge of a woman herself. Sedgwick’s comment was correct only insofar as people like Spencer and other “Social Darwinists” came along and misrepresented the meaning of natural selection (see my last comment above). That Sedgwick’s comment failed to apply to anyone actually studying biology for its own sake appears lost on you. An alternative way of looking at the problem: You’re suggesting that even if natural selection and common descent are valid theories (and they are), they are immoral. That is bass-ackwards – whether you like something or not does not make it untrue. Similarly, just because ideologically-motivated individuals distort and misrepresent the ideas and concepts to their own ends does not alter the original ideas. That’s true, you did make your claims and the bases for them. Others, in the comments, also point out that your claims are very poorly reasoned. “Others” have provided nothing but personal objections without one quote or anything else to prove my error. It’s easy to dismiss things out of hand. Just curious; have you read any substantial amount of Hitler’s works, or the works of other Nazis? I know you are a biologist, but how is your history? To claim that the blind evolution of Darwin had no effect on the thinking of the Nazis shows a certain historical vacancy. Gay science is built on the firm conclusion that God is dead. I’m working on a post that clearly shows how gay science continually claims that God is dead. I agree with you that gay science provides no logical justification for this claim through science, but my point is that science does this all the time. I don’t know how you could have missed this. You don’t get it, do you? 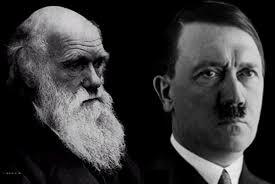 Hitler took Darwinian ideas and twisted them to his own ends. Darwin, nor any competent biologist, has ever said self-preservation equals murder. If pointing that out is a ‘personal objection,’ then yes, I have a profound personal objection to rampant stupidity. Hitler understood Darwin about as well as you do (not very well at all). He did not twist them as much as expand them to human evolution. I’ll take your response to be no, you have not studied much history. Sure he did. Darwin didn’t say anything justifying murder, genocide, or the like, did he? Of course not. So why are you making history up? Again, before you claim that I’m making history up, I would like to know what you know of history. What have you read by Hitler or other Nazis? Did Darwin think the world was governed by a creator, that human life was special or did he feel it was purely material? Do we look to biology for morality or to God? What ideals should man place above his door? No, I haven’t read Mein Kampf, for instance, nor much Nazi literature. I do know however that they murdered 6 million Jews, and I know biology. Genocide has no part in biology. So I fail to see your point, if indeed you have one that is intelligible. Do we look to biology for morality or to God? If by biology, you mean instincts, then yes I say we look to biology. You don’t see murder in biology, do you? You see predation, but not genocide. On the other hand, you see plenty of atrocities in the Bible, parents murdering their children because “God told them to,” and other horrible things. Jesus may have been moral, but Christians are, often enough, horribly immoral. Meanwhile, all of the atheists that I’ve ever met who have actually given the matter any thought at all (and being one, I’ve met many), have been tolerant, kind and moral, as far as I could see. This why history is important. The Atheists that I view in history where far from tolerant, kind, or moral. You in fact have been the direct opposite of your claim. So did Hitler! Bingo! You get it! The Will To Power! I believe that I am acting in accordance with the will of the Almighty Creator: by defending myself against the Jew, I am fighting for the work of the Lord..
Again you put words in my mouth. I never said Hitler was a atheist. I was referring to communism. Historically I see the idea that survival of the fittest being the ruling idea produce much murder. You should stay in the lab. My mistake then – you didn’t say Hitler was an atheist. But you DID put the choice – biology/Darwinism vs. God. Sorry for assuming that you think that that meant Darwinism = atheism. When? I’ve never met a cannibal. Wow. I’m blown away. Are you serious? Let me see if I have this correct. You have never read any of Hitler’s works. You have never read any Nazi works. You have never read any of Marx, Lenin or Engels. You are a “specialist” in biology and therefore view the world through the lens of biology. You then want to have historical and philosophical arguments having never invested serious energy in any of these fields? This is gay science at it’s best! Enlighten me to the biological understanding of happiness. What is justice? What sort of “idols” should we hang above our door? What is good? What is the meaning of life? What is its purpose? Will you settle for an evolutionary explanation of emotions? I want you to give me your ruling ideas. What idols shall we hang above our door? I’m not changing the subject, I’m getting to the bottom line. Can you answer the question? That’s what I thought. Please stay in the lab. You have a wonderful day. We’re talking past each other. The way you’re referring to Darwinism and Natural Selection and ‘survival of the fittest’ is not how biologists refer to it. This is what I’m trying to get through to you. Biology explains why we have emotions, as well as other biological features. It explains why we have morality, but it does NOT suggest anything other than what we need to survive (food, water, etc.) and reproduce (getting along with members of our “tribe”, communication, attractiveness). Some have postulated that “parochial altruism” or ethnocentrism leads to war, and genocide/murder, etc. are part of that. But biology is descriptive, not instructive. Don’t look to biology for instructions on what to put above your door, or to justification for sociopath behaviors either. People do those things for other functional and dysfunctional reasons that are entirely their own, and may be functional or dysfunctional in the evolutionary sense. I know that’s not how a biologist would think. That is not my point. My point is that when we take a materialist model of morality and place it above the door, history has shown that this is not a good idea. On your Christian connection comments: Hitler hated Christian philosophy, as did Nietzsche. Your confusion on what Nietzsche had to do with anything shows you do not have the historical tools to have this conversation. You have already admitted that you have not read any direct accounts, so all of your information is second hand at best. Now, when you want to give me your ruling ideas let me know. We are not going to run all over the place from one thing to another. Also, you said I was a Christian, what is your definition of a Christian? Then why do you refer to Darwinism, a biological concept, if you’re not going to use it in the correct sense? We were talking about Hitler, right? How were his ties to Christian anti-Semitism materialistic or non-Christian?? On Neitzsche, yes, I’m not well-read on him. Is that relevant? I’m under the impression that his notions of morality and “will to power” had more to do with “Social Darwinism,” which isn’t really Darwinism at all. Further, I see how your notion of “ruling ideas” pertains to “Social Darwinism,” but again, that was Herbert Spencer, maybe Neitzsche (I’m not sure), and maybe others. But Darwin? Um, no. But just for the heck of it, I’ll go ahead and answer your question on ruling ideas though, even though it has nothing to do with natural selection, or any other biological concept. Generally, I honesty is at the top of the list for me – even if it is sometimes brutal, blunt honesty, or if it means admitting something embarrassing. Other than that, I am very dedicated (and defensive) when it comes to my family; and I admire selflessness, although I have to think of myself and my family first sometimes. Now, what does that have to do with Darwinist explanations of evolutionary change? Cool. So If I was hiding a Jew in my closet and an ss officer asked if I was hiding any Jews I should be honest? I don’t know if I like that one. Do you have any others? – Now, what does that have to do with Darwinist explanations of evolutionary change? – And, what of Hitler’s ties to Christian anti-Semitism? witch one would you sacrifice? Let’s look at selflessness. Do you mean you would surrender your belongings to me? If so, please make the check out to Chuck Jines. This is not a word game, it’s called philosophy. I am totally willing to peruse both questions. But please follow this one through as well. Now, you said that the atheist you know are kind, moral and tolerant people, and that given the choice between looking to God or biology for morality, you choose biology. Back to square one. What idols has biology provided that you hang above your door? This is totally relevant to our conversation. So far you seem rather reluctant in answering the question. Check out this segment from Nietzsche’s Zarathustra titled “The Way of The Creator’. It’s one of my favorite Nietzsche pieces. It really spoke to me once upon a time. Well, I guess it still does. Um, Darwin’s theories were descriptive, not something that you go and worship. Darwin, unlike all of the other 19th Century writers you’re referencing, was not a philosopher or sociologist. Why do you persist in portraying him as something that he wasn’t? That some people (Herbert Spencer, Nietzsche, Hitler, yourself) misconstrue Darwin to your own desire to formulate ideology is not Darwin’s fault. If you and those that you discuss actually portrayed Darwin’s ideas accurately, that’d be one thing. But you/they don’t. Fair enough. Just try to keep in mind that this discussion of idols is your own interpretation, and not actually something that has anything to do with Darwin, even from the most skewed and distorted perspective. “I am totally willing to peruse both questions. But please follow this one through as well. Now, you said that the atheist you know are kind, moral and tolerant people, and that given the choice between looking to God or biology for morality, you choose biology. Idols? None, other than my own instincts, my own evolved sense of right and wrong, my own evolved emotions. Following idols or ideology when in contradiction to your own instincts is pure folly. Ideology also leads to authoritarianism, I think, which is just a fancy way of saying that when someone or some idea tells you to do something that you know to be morally wrong, and you do it anyway. No, toss your idols away and think for yourself. That’s not nihilism, it’s instinctual. Also, if I’m reluctant to answer questions – it is only because I see little relevance (if any) to discuss Darwin or biology. Yes, I see a relevance to Social Darwinism, but again, that is about as correct as astrology to astronomy. I have made no statements about “gay science”, thus your statement has no relevance to the current discussion. No scientific claim can address the existence or lack thereof of any deities. Any claim that does address the existence or lack thereof of any deities is inherently non-scientific, even if those making such claims use the phrase “scientific” when stating them.